Broadway musicals are one of America’s most beloved art forms and play to millions of people each year. But what do these shows, which are often thought to be just frothy entertainment, really have to say about our country and who we are as a nation? 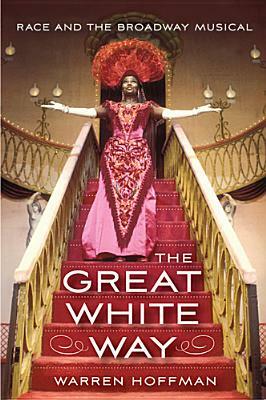 The Great White Way is the first book to reveal the racial politics, content, and subtexts that have haunted musicals for almost one hundred years from Show Boat (1927) to The Scottsboro Boys (2011). Musicals mirror their time periods and reflect the political and social issues of their day. Warren Hoffman investigates the thematic content of the Broadway musical and considers how musicals work on a structural level, allowing them to simultaneously present and hide their racial agendas in plain view of their audiences. While the musical is informed by the cultural contributions of African Americans and Jewish immigrants, Hoffman argues that ultimately the history of the American musical is the history of white identity in the United States. Presented chronologically, The Great White Way shows how perceptions of race altered over time and how musicals dealt with those changes. Hoffman focuses first on shows leading up to and comprising the Golden Age of Broadway (1927–1960s), then turns his attention to the revivals and nostalgic vehicles that defined the final quarter of the twentieth century. He offers entirely new and surprising takes on shows from the American musical canon—Show Boat (1927), Oklahoma! (1943), Annie Get YourGun (1946), The Music Man (1957), West Side Story (1957), A Chorus Line (1975), and 42nd Street (1980), among others. New archival research on the creators who produced and wrote these shows, including Leonard Bernstein, Jerome Robbins, Stephen Sondheim, and Edward Kleban, will have theater fans and scholars rethinking forever how they view this popular American entertainment. WARREN HOFFMAN, PhD, is the author of The Passing Game: Queering Jewish American Culture. He has worked professionally in the theater for more than ten years as a program director, producer, theater critic, and playwright. "In this lively and engaging book, Hoffman examines the Broadway musical's attribution of American utopian visions exclusively to those with white skin." "An important and necessary intervention in the study of Broadway musicals, Hoffman’s book reveals the cultural power the form has to shape oft-unacknowledged American attitudes towards race and identity." "The Great White Way is an eye-opener for anyone studying the racial implications of commercial musical theater. Idiosyncratic and surprising, Warren Hoffman strips Broadway of its colorful glitz and reveals its naked whiteness." "All culture aficionados should read this book—indeed, a condensed version of it should be inserted into every musical's playbill." "Hoffman's book describes how Broadway musicals reflect American social life. He gives prominent attention to A Chorus Line as depicting the 1970s as 'a decade of multiculturalism, ethnic and racial pride, and gay rights.' This useful colume is sure to stimulate discussion. Recommended." "One strength of The Great White Way is Hoffman's ability to make even the most familiar of musicals seem unfamiliar to readers by providing new meanings and resonances for dialogue and lyrics and revealing other visions of what these classic shows might have been. The enterprising musical theatre fan will enjoy this book and its refreshing perspective." "Hoffman’s encyclopedic knowledge, his love for the subject, and some astute analyses make The Great White Way well worth reading." "An important advance in musical theatre scholarship, drawing attention to the enduring power of whiteness in the Broadway musical. It will be essential reading for scholars and students alike, for its effort to braoden how we think about power and identity in musical theatre, and how these are supported by the theatricality and performativity that contribute so much to audiences' pleasure in musical theatre." "Thought-provoking analysis rooted in a deep sense of the history of American theater makes Hoffman's book a worthwhile addition to the study of the Broadway musical."